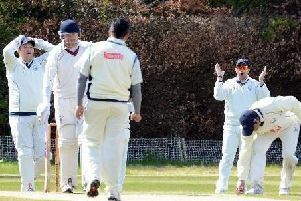 Uddingston Cricket Club captain Bryan Clarke has blamed a largely weak bowling display for his side’s seven-wicket defeat to Poloc on Saturday. Uddingston, batting first, posted a respectable 206 for four total after their 50 overs in this Western Union Premier Division clash at Bothwell Castle Policies. The Villagers’ top batting performer was opener Anwar Hafeez who managed a fine 104 not out. But his fine contribution wasn’t emulated by many in the Uddingston bowling attack. Although Harry Singh (two for 21) and Amar Gul (just 17 runs conceded in his 10 overs bowled) performed admirably, the rest of the Uddy bowlers conceded a mammoth 170 runs between them. Captain Clarke said: “We initially thought that our 206 total would be a tough one to beat, but in hindsight we were 20 runs short. “Anwar was excellent, really really good. “It was as good a hundred as you are going to see, really classy and he batted beautifully the whole way through. “But then we lacked fireworks in the last 10 overs, when we never really kicked on. “And our subsequent bowling performance was really, really poor. “We couldn’t get any control in the second half, which was disappointing. “Poloc won with 14 balls to spare, but there’s no doubt that another 30 runs on the board from us in the first place would have made it really interesting. “Having said that, a 206 total to defend should have been really dependable. Uddingston, who are now fourth in the table with eight matches of the league season remaining, travel to third placed Ayr in their next match this Saturday. In what Bryan described as “a massive blow”, Uddingston will be without the unavailable all rounder Ross Lyons, prolific with bat and ball this season.